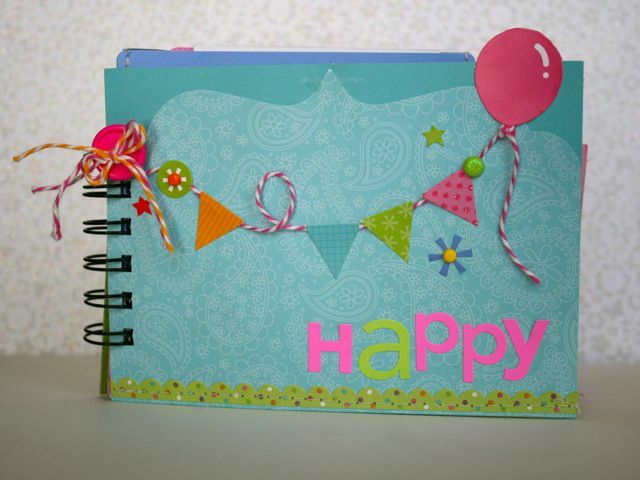 The create-a-card system is the perfect foundation for a greeting card, after you choose a base from the many shapes, sizes and patterns within the system. But, the cardstock bases and their envelopes can be used for more than just a card. For this project, I used a rainbow of card bases and envelopes to make a perpetual calendar of birthdays, anniversaries and special occasions, all bound together with spiral coils. I created a pocket for each month and tucked in a list of special dates for that particular month. Let's take a look at August's page. Turn the limeade square grid card base inside out, so the grid is now on the outside. It is such a simple pattern for the base of our page. Use tape on bottom to create pocket. Left side did not need any tape since it would be closed by the coil; right side is the fold of the card. 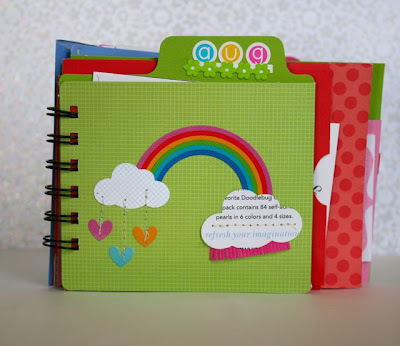 Place rainbow sticker onto the page, tilted just a bit s that the clouds on either side do not line up perfectly. Punch clouds from paper, die cuts or even Doodlebug packaging. On one cloud, adhere fringe to the bottom to add some texture and dimension. Sprinkle hearts below the other cloud punch to mimic raindrops. 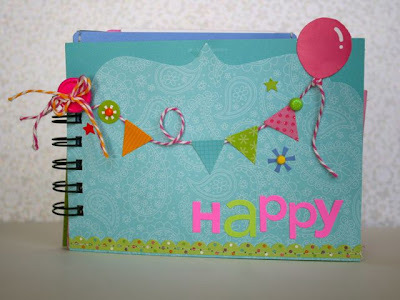 On the tab, use letter stickers for month and add flower fancy frills below. The book could be bound with book rings instead of spiral. Monthly cards/envelopes could be kept in tray, instead of binding. Instead of making pockets, special dates could be written directly on the card or envelope. So, the next time you see the cards at your local scrapbook store, dream up some ideas for ways to use them beyond cards. Happy creating! Be sure to check out Sherry's blog too!!! OMG that is simply the cutest idea...Pinning it now! oh...Design is absolutely awesome and appreciable.. Love to use it for printing purpose ? So cute, Sherry! I love the pennants and the bright happy colors.